Cemetery tourism opens the door to cultural tourism. Lori Tripoli of North Salem, NY, weaves cemetery visits into both business and pleasure trips. “I like visiting graveyards to learn about history in a slightly unconventional way,” says Tripoli, an environmental educator. Wandering through a cemetery or taking a guided tour allows us to learn about different cultural traditions, changing attitudes about life and death over the years, and to reflect on the unique stories of the people buried there. Many cemetery visitors say the experience can be profoundly spiritual. Cemetery tourists run the gamut—from people who happen upon old church graveyards and wander through them; to travelers who incorporate not-to-be-missed cemeteries (e.g. the Normandy American Cemetery and Memorial or the Pere Lachaise Cemetery in France) into their vacation plans; to true “cemetery enthusiasts” (alternatively called taphophiles or grave hunters) like Rhoads, whose interests run broader and deeper. “A surprising number of people visit cemeteries,” remarks Rhoads. “Their interests range from genealogy to photography, history, art, iconography, landscaping, architecture, bird-watching, gardening and restoration,” she says. She points out that many park-like cemeteries with magnificent trees and plantings serve as arboretums and wildlife refuges. Some offer breathtaking views of mountains, rivers and streams. With few exceptions, cemeteries have traditionally welcomed the public with open gates and free admission—even visitors who have no friends or family interred on the grounds. Many offer maps or paper guides that highlight notable graves as well as noteworthy statues, monuments, mausoleums, chapels, or architectural structures. Nearby residents and tourists alike appreciate the serenity of these sanctuaries, especially those who like to walk or run in a setting where they can commune with nature, much like in a public park. “Tourism gives us an opportunity to showcase the art, culture and historical significance of our cemetery to a wider audience,” says David L. Ison, Executive Director of The Woodlawn Cemetery in the Bronx, NY. In essence, visits to these “outdoor museums” help redress the tarnished image of burial grounds as being ghoulish, scary and macabre. Many cemeteries offer guided tours led by volunteer and paid docents, lectures, concerts, art exhibits and light shows, and hold scheduled holiday, seasonal and special events. They also collaborate with outside tour companies and provide outreach to local schools, civic organizations, scholars, and senior citizen groups. Not only does this visibility help market burial space to impressed visitors but it also increases tourism to a region, with visitors more likely to explore nearby (non-cemetery) attractions. Advances in technology over the past two decades have simultaneously popularized cemetery tourism and enhanced the experience for visitors. Tourists are finding cemetery visits listed among the top attractions on TripAdvisor, both in the U.S. and abroad. Many have extensive websites, Facebook pages, and legions of social media followers. Find A Grave, created by taphophile Jim Tipton in 1995, is a searchable, crowdsourced (and thus, prone to some errors) online database of 132 million grave records at cemeteries in more than 200 countries. Users can contribute information or use the website at no cost to search for graves of relatives or famous people, including pop culture icons. Some entries include GPS coordinates on Google Maps, and many display photos of headstones and epitaphs. The website, which was acquired by Ancestry.com in 2013, also has a free mobile app. A number of cemeteries have developed smartphone apps or audio tours that enable users to locate gravesites during a visit. 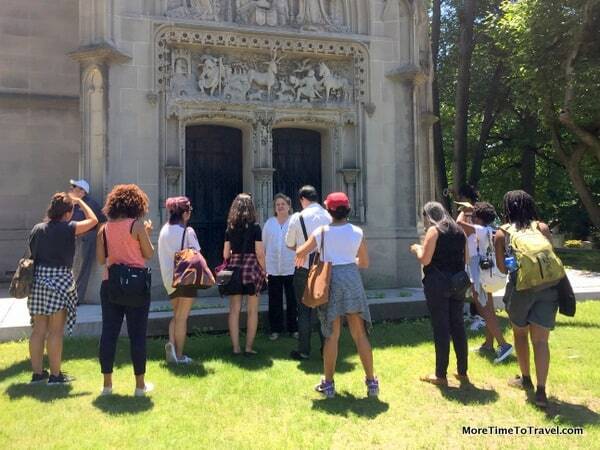 For example, by downloading a free self-guided tour at The Woodlawn Cemetery, jazz aficionados can find the graves of Duke Ellington, Miles Davis, Max Roach, Lionel Hampton, Illinois Jacquet or other luminaries buried at cemetery. Using GPS technology, the app guides them to within ten feet of each grave, and allows them to download relevant Wikipedia entries, videos and/or music on their smartphone. The app includes other thematic tours, too, focusing on architectural treasures, black history, civic leaders, civil war heroes, entertainers, memorable women, significant sculptures and more. “The idea of cemetery tourism may seem new and shocking but actually cemeteries have been sites of pilgrimage from the beginning,” writes Loren Rhoads. With the growing number of cremations and green burials, cemeteries will continue to evolve and change as preservationists and cemetery tourists protect and honor past traditions. This post is a version of an article written by Irene S. Levine published in the Sunday Travel Section of the Chicago Tribune online and is scheduled to appear in print on July 26, 2015. The feature included two other related pieces, 6 Great Cemeteries for Tourism and Tips for Visiting Cemeteries as a Tourist, which are also reprinted on More Time To Travel. The feature story also appeared in the Hartford Courant, the SunSentinel (Miami), the Orlando Sentinel, The Virginia Gazette, and Tidewater Review. Visit Loren Rhoad’s website for more information about cemetery tourism. D and I have been visiting cemeteries for decades. They are fascinating places and can give you a window into the history of a place. Two of the most interesting we have been to are the cemetery on Norfolk Island – convicts, guards and bounty descendants and the cemetery in Malacca, Malaysia. I can see that the Find A Grave app could be handy. I was once lost on a mountaintop in Malaysia surrounded by gravestones of the world’s largest Chinese cemetery and sure could have used an app that might have pointed the way to the exit. I agree with Paula, on the depth (no pun intended) of information that can be found in a cemetery. It is a peek into the history of an area – we consider them ‘must visit’ stops along the way. They really are a part of any community! I was aware that theme travel was on the rise, but never thought cemeteries had gotten on the bandwagon and had such an interested audience. But it does make sense as I recall how much we enjoyed our visits to the cemeteries of Paris, Buenos Aires, Saint Paul de Vence, Mexico (for the Day of the Dead), and others, including our local one here at Arlington Cemetery. Great article! Sounds like you’ve visited some favorites! I’ve always visited cemeteries in my travels. I find it amazing how they look from country to country (or region to region), and the different rituals involved. Yes, so interesting to learn about different customs! Cemetery tourism has become so popular. A friend of mine has a blog devoted to it. I too enjoy wandering through the peaceful grounds, reading grave markers and wondering about these men, women and children who have passed away. Touring cemeteries is a great way to learn about the local town and it’s most important people. I remember family trips when I was a kid to visit graves of relatives at Forest Lawn Memorial Park in LA where we’d wander around looking reading the inscriptions and trying to find famous names. We’ve vivited many cemeteries over the years and one of my favorites was a place in Kauai with fences of volcanic rock, a picturesque church and a separate children’s burial area. Graves were segregated by religion as well as race and the cemetery gave some great insights into the history and customs of the times. My family was sheltered from cemeteries and thought them morbid. That’ so interesting about the segregation. I have learned a new word: taphophile. We love visiting old cemeteries. Our favorite of the recent ones was in Santanyí, on the south side of Mallorca. The stone carver in that village is amazing. There is another renowned one in Lloret-de-Mar, Costa Brava that makes for great photography. I know the one Anita mentions on Kaua’i if she’s referring to the one overlooking the sea in Kapa’a. What a lovely place to rest for eternity that is. Apparently, stone carving is becoming a lost art as more graves are being made in granite, etched by machines. I’ve tended to avoid cemeteries in the past, finding them a bit unsettling. But more recently I’ve visited one or two and agree that they are great places for social history. My favourite (although not strictly a cemetery as such) was a Garden of Remembrance in Puglia where a tree had been planted for each soldier who didn’t return from WW1. That sounds like an incredible visit. We visited an American Cemetery in Germany, also a humbling experience. I love cemetery tourism! Top three I have visited: Eleanor Rigby’s grave in Liverpool, England, Author’s Ridge in Concord, Massachusetts, and basilicas in Florence, Italy! So many more. While we occasionally visit cemeteries and I knew some famous attracted visitors- it never occurred to me that there was such a thing as cemetery tourism. Amazing! More popular than I imagined, too, Billie! Visiting cemeteries has never been my thing, although I did visit the Modernist Cemetery in Lloret de Mar whilst on a photo walking tour with a group of travel bloggers and I did enjoy seeing the beautiful sculptures. When I visited Recoleta Cemetery in Buenos Aires I did not much enjoy it. Perhaps I need to stick with group tours when visiting cemeteries. Doing research before hand, having a guide or using a map can really enhance the experience. I do enjoy visiting a cemetery in new destinations. They give you such an historical perspective, but I had no idea that it was such a segment of the tourism industry. We have many in the Boston area where important literary and historical figures are buried. The Granary Burial Ground is a very popular site downtown-and guides in period costume give tours all day. There are an amazing number of taphophiles (grave hunters)!